These popular feeders are a very colorful addition to any garden. 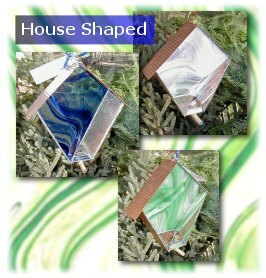 Made primarily to attract chickadees and finches, it has a perch at the bottom that can be removed to discourage house sparrows. The roof and sides are made from copper. It's ready to hang with a copper hook. Size is approximately 6x6x2, and holds 2 cups of seed.